Another post, another Metal Gear and the game that most fans of the series would pick as their favourite. It was a toss up for the 8th and 7th positions between MGS3 and 4, a difficult decision because both games do so much well. I opted for the older game for several reasons, but splitting hairs between them is hardly worth the effort. 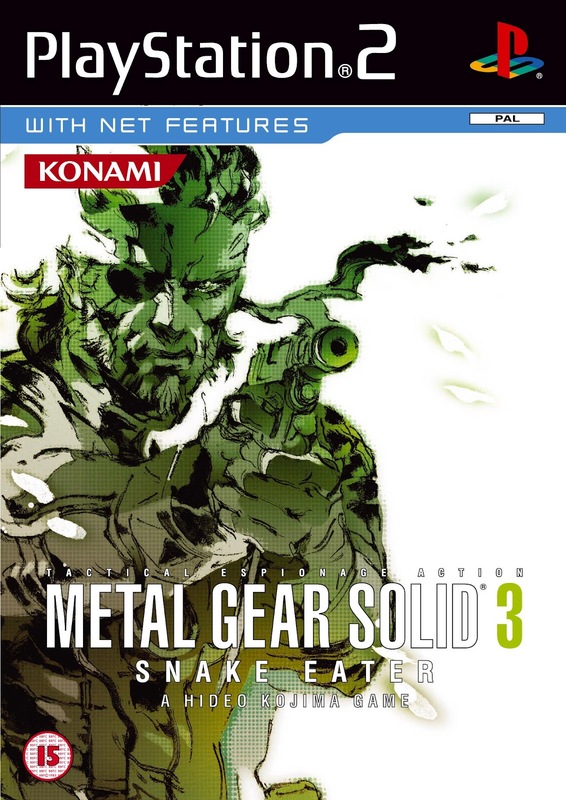 Snake Eater makes it onto the list for being the perfect standalone interpretation of the Metal Gear formula. Stealth in its purest form, you must use camouflage, survive on limited supplies, use Close Quarters Combat (CQC) to knock guards out silently and traverse without a radar for the first time. The reason for this return to a more basic approach to stealth is that Snake Eater is the earliest game in the series chronologically. Set in the Cold War, the 60s era provides the perfect platform for Kojima to create his own Bond style adventure. Ridiculous over the top foes? Check. A femme fatale to seduce the hero? Of Course. A hero full of self assurance and a licence to kill? Yes. A title sequence with the best Bond Theme since Diamonds? Most Definitely. All of that said it isn’t Mr Bond who has been tasked with proving that America had nothing to do with a terrorist strike on Russian soil, it’s Snake. Not Solid Snake as we know him in the other Metal Gear games, this is Naked Snake the man who would go on to become Big Boss. Before Snake Eater, we had never seen Big Boss in the Solid series, only mentioned as this ultimate bad guy that Snake had defeated back in the first two MSX2 Metal Gear games. Solid and Liquid Snake were actually cloned from Big Boss in a bid to create ‘The Ultimate Soldier’, something Snake only learns in MGS1. Metal Gear Solid 3’s story is the most ‘complete’ in series history, largely due to its place in the canon. With no prior events you go into this with a clean slate, to delve into a story of deception, intrigue, and a love that runs deeper than just a man and a woman. The tragic tale of The Boss, a hero who is forced to undergo to lie to everyone she loves to complete her mission is reflective of a certain other character who’s deception carries over the entire series (And who may in fact be The Boss’s son). If you want to see me cry, you can either play Robyn’s Dancing On My Own Live Lounge, make me watch House of Flying Daggers or make me play the final scenes of Snake Eater; I’m that susceptible to the emotion. Playing Metal Gear Solid 3 after discovering the truth behind what happened next during MGS4 makes the whole experience that bit more electrifying. You see the relationships between characters take on a whole new dimension, specifically that of Big Boss and his commanding officer Zero. It took until Guns of The Patriots for me to understand why Kojima had sent players back to the 60s for Snake Eater part if the reason both games appear side by side in my list. Moments like the hour long sniper battle with The End, which can be avoided altogether if you’re smart enough, are what make MGS3 so enthralling. That Kojima was bonkers enough to have you climb a ladder for nearly 5 minutes straight after this, while the Snake Eater theme echoes through the wind, proves that this is a series unlike any other. The best place to start for anyone who hasn’t delved into the series yet, this is a heartbreaking, intense and magnificent game that demands a place in your collection. How can I play it? – It’s best to play the updated Subsistence version of MGS3, as it comes with a 3D controllable camera, which is invaluable when sneaking through the jungle. With copies of the PS2 version going on ebay for high prices, it’s best to get the HD collection for PS3 or 360, which also comes with MGS2 and Peace Walker. Tags: Metal Gear Solid 3. Bookmark the permalink.